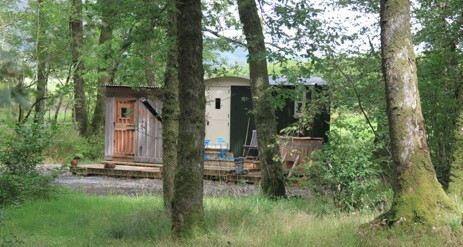 Glamping Wales with personal hot tub experience on spectacularly beautiful farm on edge of Brecon Beacons. 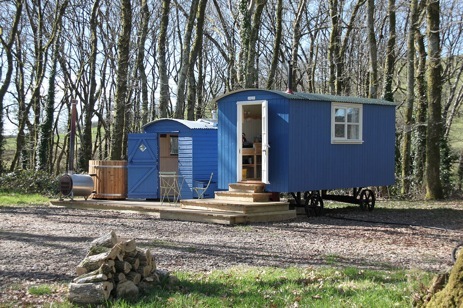 Escape and relax in one of the shepherds huts at Mandinam in Carmarthenshire. 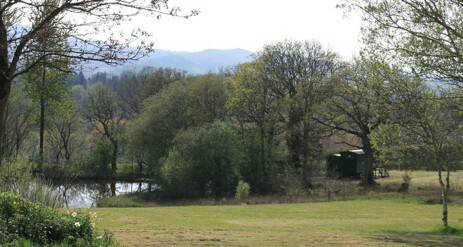 Guests are free to roam in the surrounding 450 acres of farmland and woodland with amazing views of the Towy Valley. Stay in one of the four shepherds huts, each in its own secluded area, providing a uniquely private Glamping experience including wood burner, barbecue and your own private hot tub. Mandinam is the perfect location offering peace, quiet and beauty. 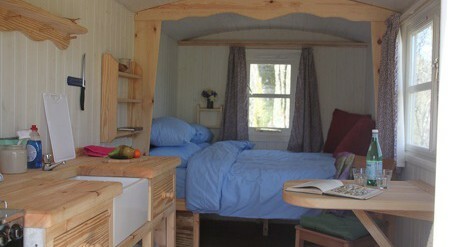 For luxury camping at its best this authentic Gypsy Van offers the perfect retreat and a place of solitude and reflection in its own private part of the estate. Nestled against a wood, away from it all beneath the red kites in the day and starlit skies at night….what could be more romantic? 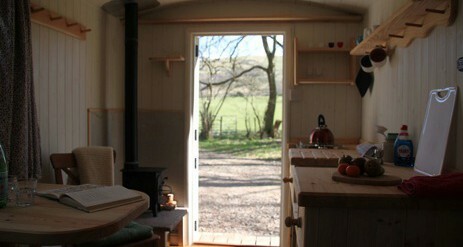 Completely secluded with lovely views across the hills, this furnished authentic van has the added bonus of a hot tub. This is a very sweet nest, with a wooden deck and walkway connecting to a smaller hut which contains a good bathroom and loo. Another wonderful place to find peace and solitude. The outdoor hot tub is fantastic. One wood firing will give you toasty-hot water for over two hours and sou’wester hats are supplied for wet weather. All the electricity is provided by solar power and there are plugs for laptops and mobile phones. To continue the green theme, there is another wood burning stove in the van . Wood can be supplied. This is a place for lovers, friends, people who just want some peace and quiet or who like the big outdoors but enjoy warmth and comfort. Who could resist? If you feel like an escape, get in touch! The Shepherd’s Hut at Mandinam was set up to offer the experience of living in the countryside while enjoying the comforts of our eco friendly hut. This wonderful open space incorporates “green” with luxury. This large hut sits by a wildfowl lake. A beautiful metal verandah is in place before the front door, and from there you could drink your morning coffee on a fine day, or enjoy a drink in the evening in the wonderful peace and quiet while you look at the magic view to the distant iron age fort. The hut is fully insulated and contains a wood burning stove which will keep you warm even on the coldest day. There is small belfast sink, and for the days when you don’t want to barbeque, a gas double burner with a small grill. 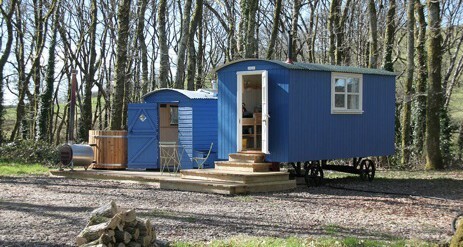 There is a separate mobile shower and loo with a view and of course a decking walkway to your own private hot tub. This wagon is at the edge of a bluebell wood which, during May, will be covered in bluebells. It is complete with all the comforts of the other huts, shower room, hot tub, solar power and woodburning stove in another peaceful and romantic location of it’s own. This is a sweet wagon ready for you to enjoy. Another wagon in the same style as the other Huts, this time on the edge of a glorious oak wood. It has a deck, a hot tub, a shower hut and solar powered electricity and of course a wood burning stove to keep you warm inside the Cabin. It really is a beauty and we are looking forward to people having a very special time there. Each Hut at Mandinam comes with its own outdoor hot tub within your own private area on the estate to add extra luxury to your glamping experience with no disturbance. Supporting a “Green” Ethic the hot tubs are heated using a wood burner. 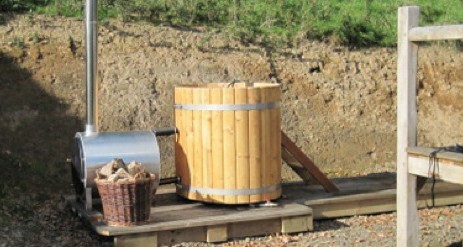 Wood can be supplied for the tubs and one wood firing will give you toasty hot water. The Brecon Beacons area is well known for some of the darkest skies in the UK, offering the perfect opportunity for you to stargaze from your hot tub. On a clear night, stargazers are able to see the Milky Way, as well as major constellations and sometimes even meteor showers. You could come by train to complete the green theme and we could collect you from Llangadog station 2 ½ miles away. Or you could come in your car. There is plenty of space to park. This is a place for everyone. Dreamers, greenies, adventurers or just those of you who simply want to get away from it all. Mandinam is set in the perfect location for exploring Mid Wales and Carmarthenshire. Below are only a few things to do in Carmarthenshire.